An important anniversary slipped by relatively silently this year on the 14th of October. On that day, 30 years ago in 1978, President Jimmy Carter signed into law House Resolution 1337 and Senate Amendment 3534. The brewing of beer had become legal at home. But there is an even more historic anniversary this year. In 1933, seventy-five years ago today on the 5th of December, the state of Utah voted to approve the 21st Amendment to the Constitution of the United States of America. That vote terminated the nearly 14 year ignoble reign of the 18th Amendment, Prohibition. It had now become legal to manufacture, distribute, and sell alcoholic beverages, and by extension, to drink them. For the 14 years prior, the invitation, "Let's go have a beer!" had been an invitation to felony had not been possible. Utah was the 36th out of 48 states to vote in favor, achieving the constitutionally required majority of 3/4 of the states. Some might find it ironic that Utah, of all states, would vote to allow alcohol. On closer examination, it may have been sagacious of that state, in light of its founders' tribulations, to repudiate Prohibition. The 18th amendment is the ONLY amendment to have eradicated constitutional rights rather than granting them. By the adoption of the 21st Amendment, the 18th amendment is also the only amendment to have been wholly overturned by another. It also might be possible that Utah's vote for the 21st Amendment may have been an attempt to right a wrong. Utah's yea vote, 14 years earlier on 16 January 1919, achieved the 3/4 majority to effectively ratify the 18th amendment, Prohibition. By the way, on 4 December 1933, South Carolina voted against the 21st Amendment. It was the only state do have done so. Although the 21st Amendment lifted Prohibition nationally, it left open the possibility of local prohibition. It gave to the states the right to control the importation of alcohol within each state's own borders. This is sometimes read as a partial trumping of the Commerce Clause (Article I, Section 8, Clause 3) of the 'un-amended' Constitution, which had given to Congress the ultimate right to regulate commerce. Recent rulings of the Supreme Court have challenged this interpretation, especially in regard to three-tier distribution issues. Take a moment today to remember American folly and to thank American sagacity by hoisting a beer, sipping a whisky, or drinking a glass of wine. Say "Iki Dugno" [ICK ih DOOG (like took) nuh] ... legally toasting "down the hatch," in Lithuanian. My last name is Cizauskas, after all. Didn't the enactment of the Cullen-Harrison bill on 7 April 1933 legalize beer? Well, yes and no. Go here. At the blog for the aptly named 21st Amendment Brewery, there's a concise analysis of how Prohibition could even have occured in the first place. Go here. Advocating vigilance, David Turley at Musings Over A Pint has a summary of the efforts of latter day Prohibitionists. Go here. The poster above (edited by me) is courtesy of the Brewers Association, an advocacy group for the small breweries of America. It has a posted a page on the Repeal of Prohibition. 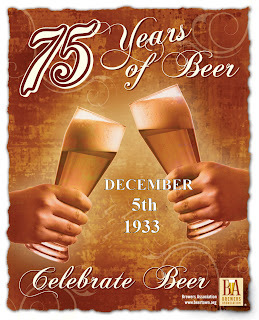 Go to www.75Yearsofbeer.org. Posted as part of The Session: beer bloggers posting on identical topics on the first Friday of the month. Actually Tom, the consumption of alcoholic drinks was not illegal during Prohibition, only the manufacture and distribution was.